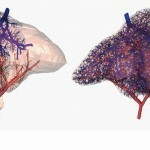 One of the biggest problems with printing human meat was the creation of blood vessels and ventricles. Making a solid mass of flesh was easy but adding a way to pump blood and other nutrients through the flesh was more difficult. Now researchers at the University of Sydney, Harvard, Stanford and MIT, have solved some of these problems by creating a skeleton of vessels and then growing human cells around them. Once the vessels are stable, they are able to dissolve the 3D printed material. The vessels are then used to move nutrients through bioprinted tissues, allowing for better cell differentiation and growth. This technique will allow researchers to build “organs” in the lab by growing cells on the network of capillaries. The researchers believe this will eventually lead to true organ regeneration, which sounds amazing.